Hello and welcome to another exciting adventure with the Pearons! If you’re reading this, you’ve probably experienced the wilds of Seattle and Kansas City with us (if not, click here), and have an idea of how we do this. We’ll try to trade off who writes the entry each night, or do a joint entry. Sometimes, if one of us is a sissy and falls asleep, the other gets stuck with the authoring for the night … but the craziness all evens out in the end. For this trek, we’re off to London for 10 days, then a quick day to trip to Paris before heading back stateside. As we write this blog, we are sitting in the concourse of Toronto-Pearson, International (YYZ) in Toronto, Canada. We survived the flight from Lambert, International (STL), and we are now prepping for the next leg to Reykjavik, Iceland (KEF). The first day of our journey began really early. My Mom (Joy) drove us to Mo-X in Columbia at 4 a.m. to catch our shuttle to STL. After arriving at STL, we had to wait about 45 minutes before we could check our bags. We then went on to our gate, where it was a 2.5-hour waiting game before boarding. We boarded our plane at about 10:15 a.m. and landed in YYZ around 1:30 p.m. (EDT). I stole Matthew’s seat by the window and it was a beautiful view. About five minutes into the air after leaving STL. YYZ is not our friend and I’m afraid will never be our friend. After going through customs (which was a cinch), we then found out we needed to get our bags before we could go any further. This confused us since the man who checked our bags at STL said we wouldn’t have to worry about them until we landed at KEF. So, we found where we were to pick up our bags and found only my bag … which makes Matthew not a happy traveler … which then trickles down to Valeri not being a happy traveler. After waiting about 45 minutes, his bag finally showed up and we were able to go into the rest of the airport to find Terminal 3. We’re very thankful for our seven-hour layover to give us plenty of time for moments like that. Heading toward Terminal 3, we found where our bags were to be dropped off, so we checked them in and went on our way. Hopefully, we are happy travelers when we arrive in Iceland and are given our baggage right away so we can go on to our next flight (to London). 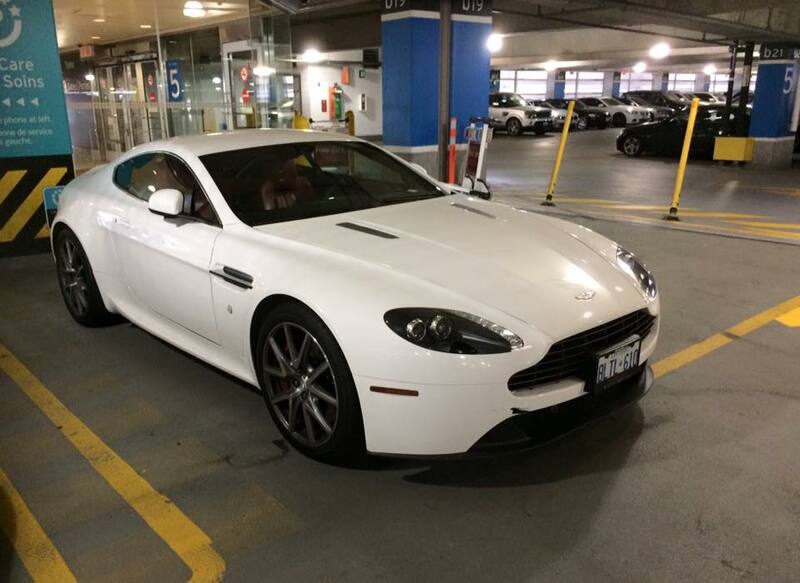 While en route to Terminal 3, Matthew looked through a window and saw what he’s been waiting for his whole life … an Aston Martin. I’m pretty sure this was YYZ’s way of apologizing for the baggage mishap. We spent about 15 minutes in the garage area while he took pictures and peeked inside the Aston. I tried to get a picture with him and the car, but he wouldn’t stop circling the vehicle. After I convinced him he had taken enough photos to last a lifetime, we started back toward Terminal 3, which involved a train ride. :) We like train rides. Finally, Terminal 3 is in sight, but the gate we need is not. After finding our gate, the food search began … which was harder than one may think. YYZ only gave us three options, so we broke our vacation rule of not eating fast food and decided on Wendy’s. However, this gave Matthew a chance to try one of Canada’s signature dishes, Poutine. He very much enjoyed it. Be sure to check our photos, and other updates at http://CL3VER.life!